Mike and I had a quick “date night” a couple of weeks ago. We had an hour sans kids before a meeting, and while we would have usually headed to Boulevard Burger (my favorite cheap place in town), I wanted something nicer – so we headed to The Vine instead, armed with a restaurant.com coupon. We got there around 5 PM on a Tuesday, and the place was deserted, though people started coming soon enough and taking advantage of their outside seating during such a lovely day. Service, needless to say, was very prompt and good. We were both hungry so we decided to sample several items on the menu. Most of the stuff was good but not exceptional, and definitely overpriced at their non-discounted prices. 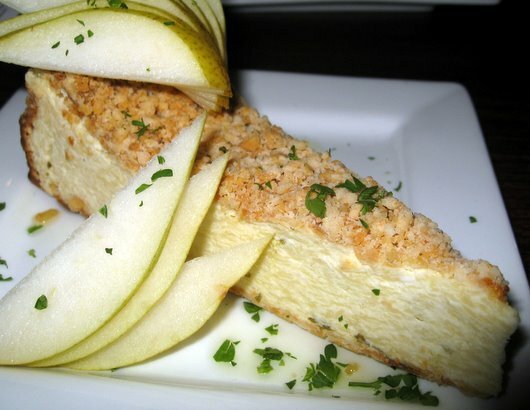 We started with their Parmesan Cheesecake ($5), which was basically a cheese log mix to be eaten on crackers. It was very subtly flavored and, while not unpleasant, not particularly compelling, I wouldn’t order it again. 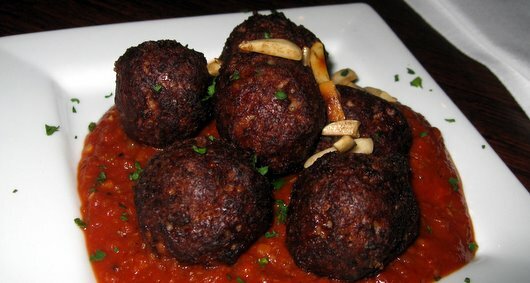 The meatballs ($6) were more flavorful, but I found them rather dry and a bit overseasoned. Again, not something I’d bother with again. 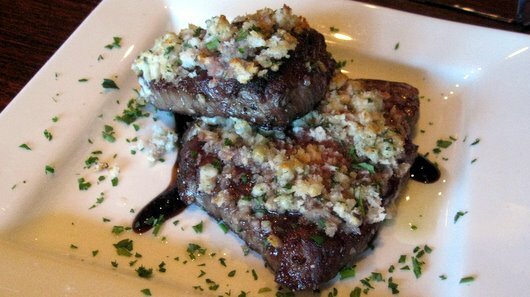 The Gorgonzola crusted filet mignon ($13) was better, though the meat is prepared medium which means the beef is nowhere as juicy as it should be. It was very tender and it had a pleasant flavor, though it didn’t taste very blue cheesy. It was a pretty small portion given the price, but I might order it again. 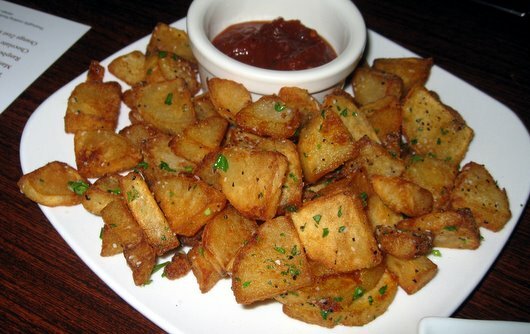 The patatas bravas ($6 regularly – but $3 during Happy Hour) were nicely seasoned and steaming hot, and I enjoyed them more than most of the other dishes. The real winner, however, was the Point Reyes Blue cheese platter ($7). It came with a nice portion of absolutely delicious, creamy cheese, bread slices, dried fruit and caramelized walnuts. The whole combination was great. I’ll definitely order this again. For dessert, Mike and I shared the chocolate lava cake ($6), which again was pretty tasty but not extraordinary. I might have it again, but would try something else first. We had some complimentary rose wine with dinner (“like” The Vine on Facebook for occasional promotions), which was just sweet enough and very refreshing. In all, it was a very nice meal. We paid about $35 total, including tax, tip & the restaurant.com coupon price which was a good deal, but regular prices are too high. I’ve been to The Vine several times in the last few months. I find it a nice place to have something light to eat and a reasonably priced glass of wine. Their tapas menu has expanded somewhat and they now serve desserts (which we haven’t tried). Most of the tapas I’ve tried are good to very good. I particularly enjoyed the croquettes ($7) and the Spanish omelet ($5). However, my half-Spanish friend Paz wasn’t as complimentary. Their wines, though, are almost universally good. They seem to no longer be open on Sundays, by the way. Well, I finally went to The Vine with a few friends a couple of nights ago and we had a very nice experience. The Vine has a limited selection of wines – two sparkling wines and no more than ten white and red wines – but what we had was good. I had a glass of the Cava and a glass of the Malbec. The Cava was light and bubbly, not too dry and easy to drink – I quite enjoyed it. The Malbec was very nice balanced, substantial without being tanic, a very good all around red. A couple of my friends had the French something or other, it tasted like a cab and was deep and earthy. Also very enjoyable, though better with food, I’d think. The room is very nice, quite sophisticated for San Leandro. Service was attentive and the waitress told us that they will be expanding their menu (and hopefully serving desserts) and may expand their hours as well. The Vine, the new venture from the owner of The Englander, has finally opened. This cute spot is located next to The Englander (they displaced an old-time hair salon to do this, which is not very nice at all), but it’s quite a bit classier. I stopped by to take a look, but I haven’t eaten there yet. I’ll report when I do. They have limited hours, they’re open 4 – 10 PM Tuesday through Saturday, and Sunday 11 AM – 6 PM – which is a further bummer as I like having places to go late. But it’s definitely a good addition to the San Leandro culinary “scene” . Glad I found your blog, was searching reviews on The Vine. As a San Leandro resident, I too am pleased to see this addition and agree that an inviting place for later in the evening would be nice.